The holiday season is one of the most wonderful times of the year. But it can also be difficult if you’re trying to decorate for Halloween and Thanksgiving back to back. As long as you’re not dedicated to transforming your home into a haunted nightmare, it’s easy to find seasonal harvest decor that also works for Halloween. Check out some of our best harvest ensembles for the front porch, bathroom, living room and dining room. 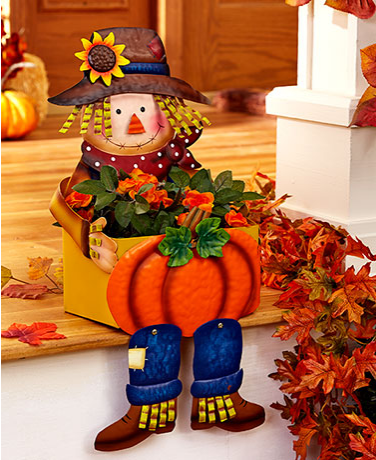 Harvest Porch Decor can be displayed during the entire autumn season. 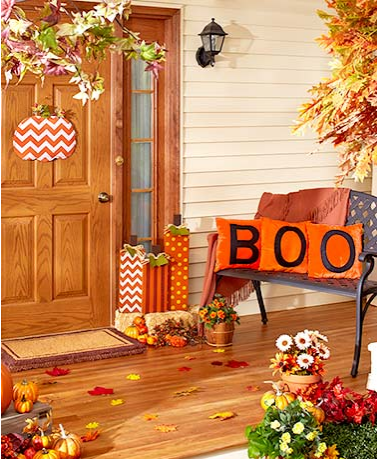 Get a Pumpkin Door Hanger and Wooden Pumpkins to liven up your porch for fall, and flip around the Set of 3 Pillows for a Halloween theme. 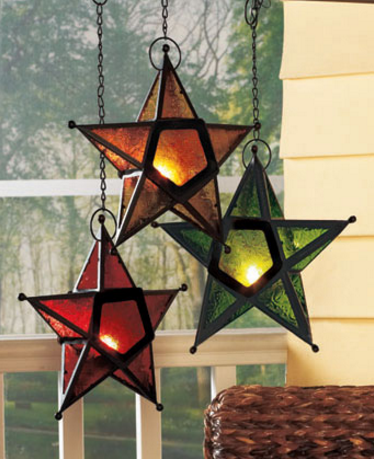 Add beautiful accent light to your porch with the Hanging Star Candleholder. The glass panels feature an etched design and the perfect color for fall. It opens in the center to reveal a holder for your tea light candle. The Seasonal Porch Sitter Planter will look great on your front steps all season long. The cute character is holding a planter box. Add your favorite flowers or fall plant to the box for a display your guests won’t forget. Easily stay festive no matter what the season with the 9-Pc. 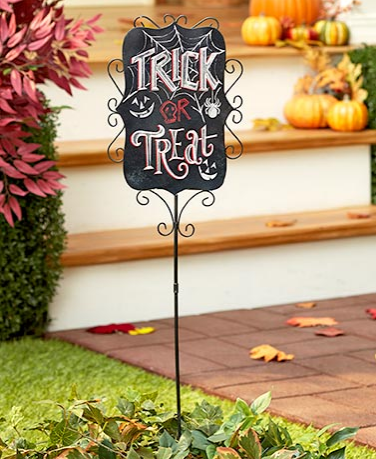 Interchangeable Seasonal Yard Stake. With a variety of seasonal greetings to keep you covered all year, it has what you need to get through the holidays. The Pumpkin & Stars Bathroom Collection brings a warm, seasonal autumn touch to your bathroom space. 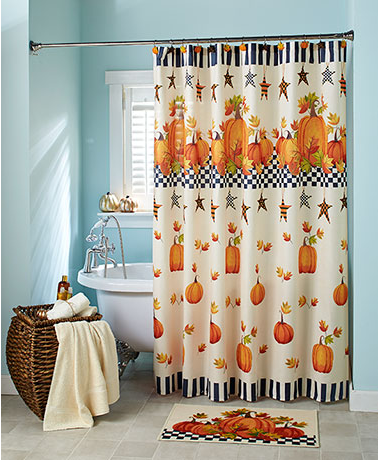 Get a wide range of useful items to cover your entire bathroom with pumpkins, country stars and fall leaves. 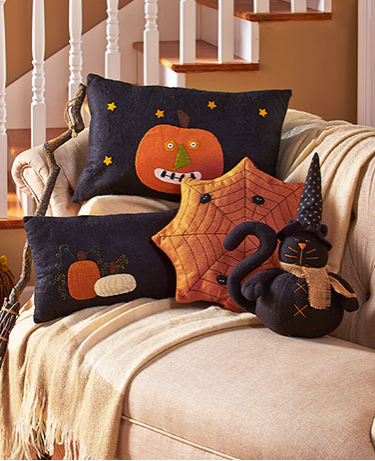 Decorate your living room with family-friendly Halloween decor using a Primitive Country Halloween Pillow. The harvest colors and symbols are ideal for autumn, and the Halloween elements are simple and innocent. The Primitive Country Stuffed Pumpkins add a simple, stylish touch to your harvest display nearly anywhere in your home, even as a dining room centerpiece. Each features a patchwork design with traditional colors. 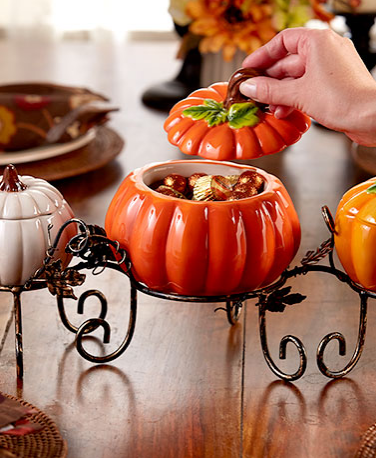 Create an autumn display for your kitchen or dining room table with a 4-Pc. Ceramic Pumpkin Centerpiece. 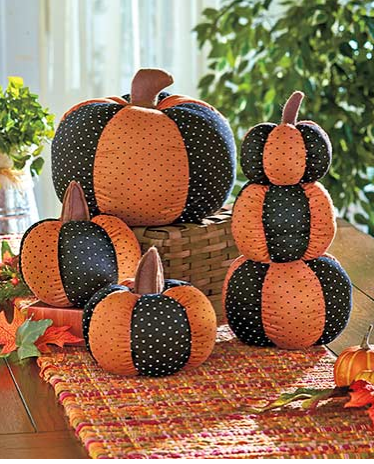 Each pumpkin has a removable lid and a spacious interior for holding Halloween candy or random goodies. Can I receive a catalog in the mail ?